Tyler Lafreniere "Take Me Out"
Tyler Lafreniere’s work probes contemporary masculine identity by reinterpreting iconic cultural imagery. By examining male form and masculinity, he makes apparent the raw social discourse that surrounds men in the 21st century. Lafreniere attempts to access the special relationships and bonds that have existed between men throughout history, and comprehend what that means in the contemporary world. For this exhibition entitled, Take Me Out, Lafreniere focuses on baseball, the quintessential American sport. Baseball occupies a heroic space as the all American male sport, it is a gentleman's game of strategy and skill. Success is marked more by moments of personal prowess and triumph than physical mastery of an opponent. By constructing an abstracted infield inside the gallery, Lafreniere sets the stage for sport and pastime, while leaving the playing field largely absent of action. A vacant pitchers mound faces a video of a catcher, calling for a pitch which will never come. Foam fingers hang static with an arbitrary cheer. A scoreboard shows a game teetering on the edge of extra innings, but clearly the play has stopped. 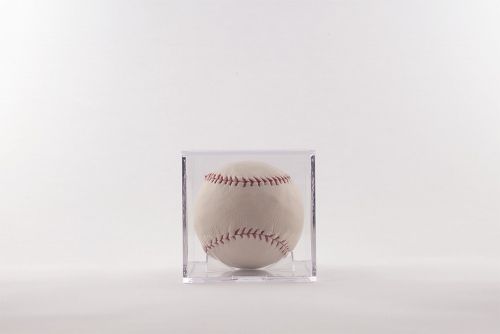 And baseballs sit encased, yet lack the signatures of a player to bestow value. Through the process of recreation, the work becomes an homage to the authentic object while concurrently reframing these objects for critical re-evaluation. This purposeful tension dissociates the symbols from their original meaning, creating a space to analyze the traditional elements of the sport and their connections to masculinity. Tyler Lafreniere was born in 1983 and raised in Midcoast Maine. Lafreniere earned his BA in Fine Arts from Hampshire College in 2006. During his undergraduate studies, he also concentrated in Printmaking at Goldsmiths University, London. He had solo shows with Dose Projects and most recently at Launch F18, where he is represented. He has also shown with, Storefront Ten Eyck and Field Projects in New York and various locations around the United States. Lafreniere lives and works in Brooklyn, NY. This is his first exhibition with Buoy Gallery.